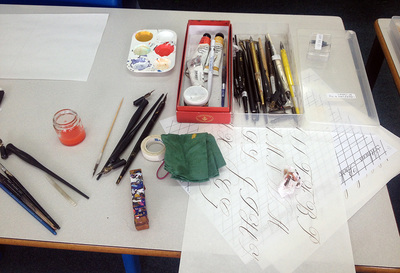 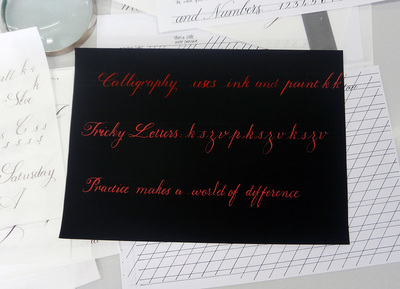 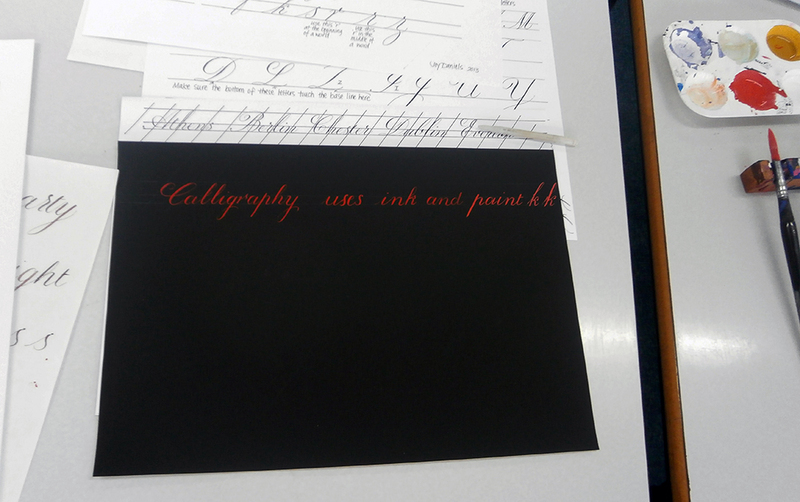 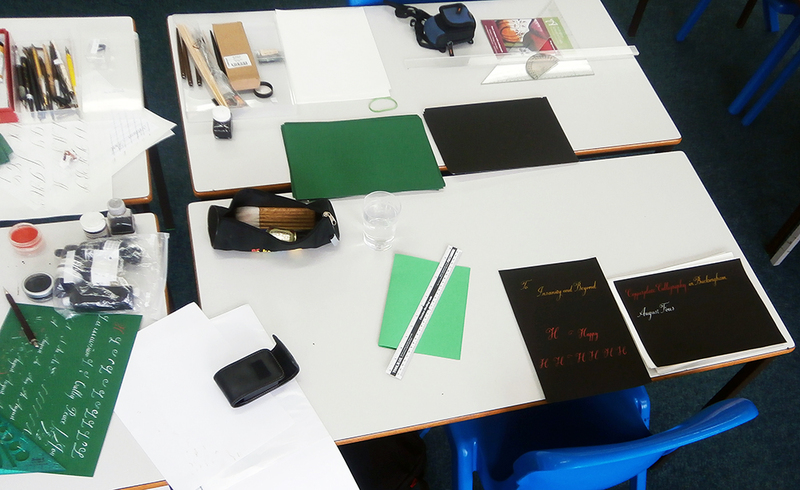 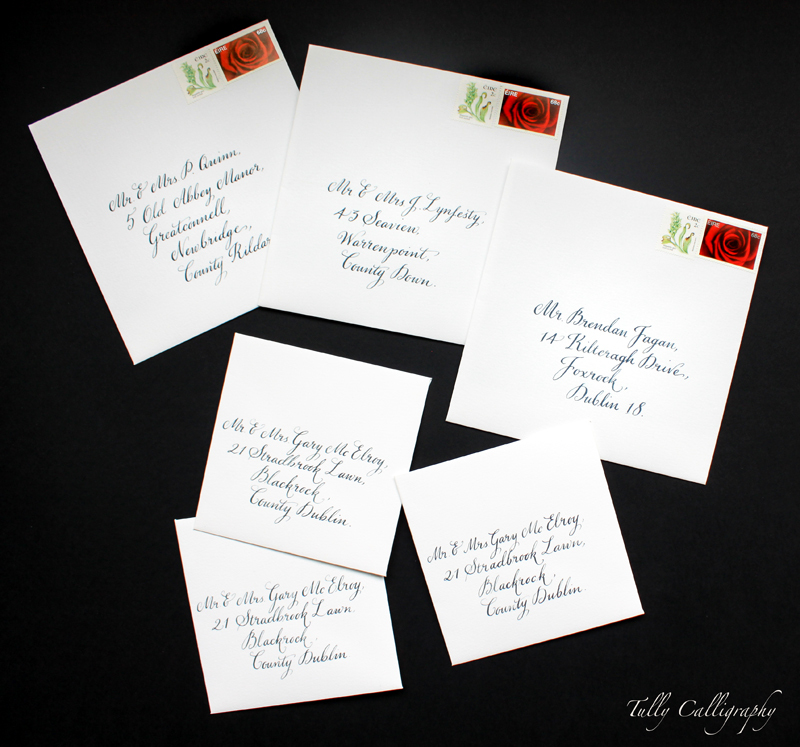 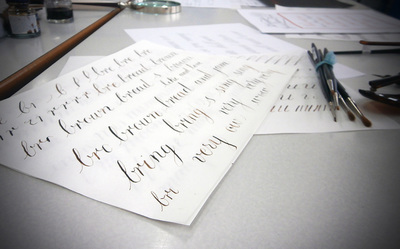 Ah yes, Tully Calligraphy serves all continents. 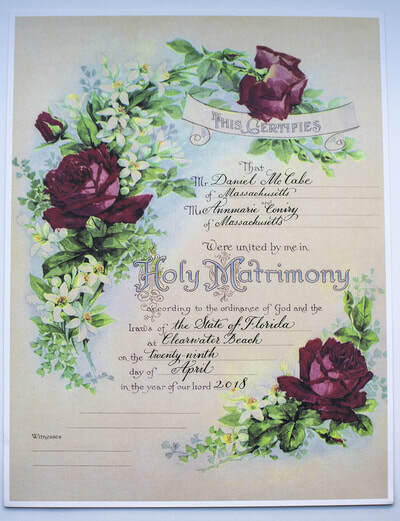 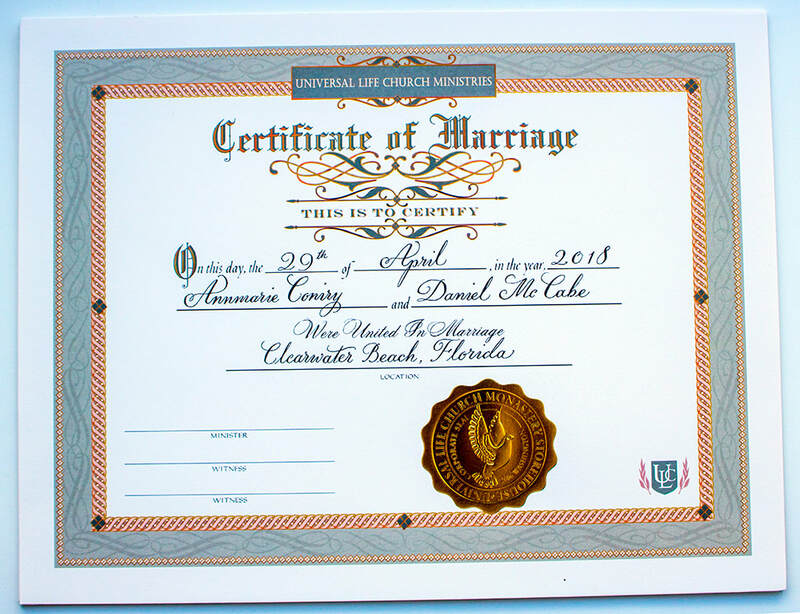 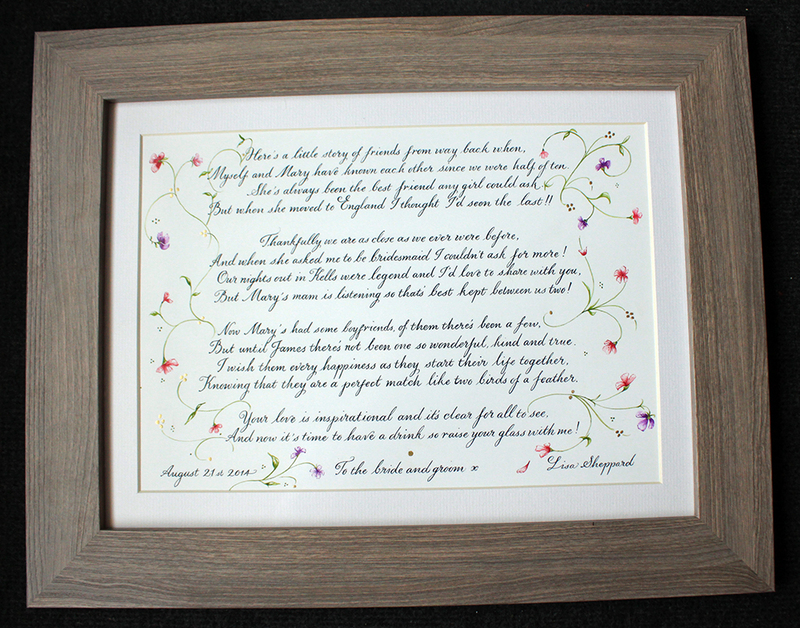 A couple of marriage certificates for a couple in USA, for the friendliest of clients I've ever welcomed to the Scriptorium. 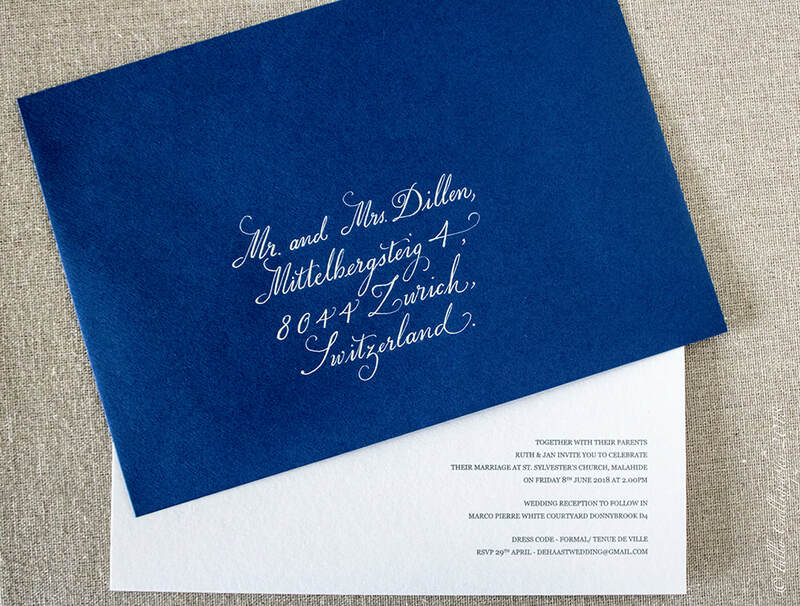 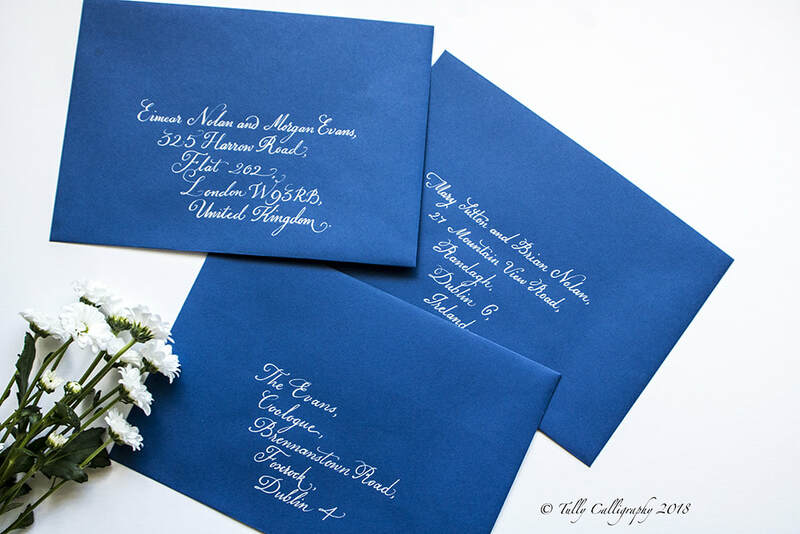 Now based back in Dublin, it was a pleasure to write these envelopes for Ruth and Jan. Not only were they fabulous envelope paper stock in dark midnight blue, but I had some beautiful Dutch addresses to write also - always a nice break from Irish familiarity. 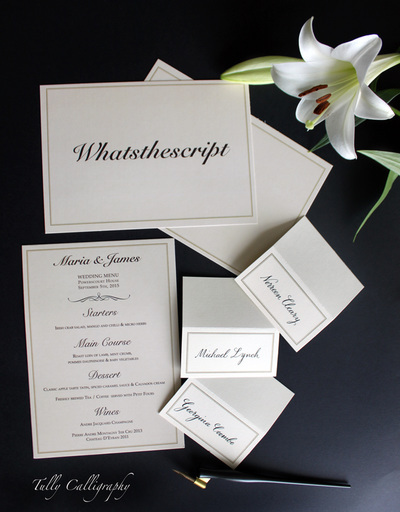 Following some metallic silver and gold trials, we decided on an off-white to match the invites. 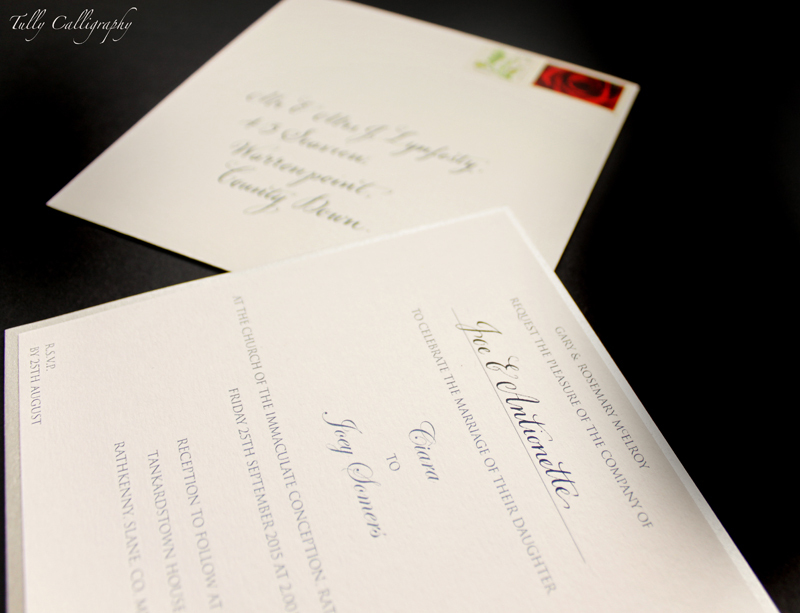 I wish these really cool clients a great wedding, loved working with them. 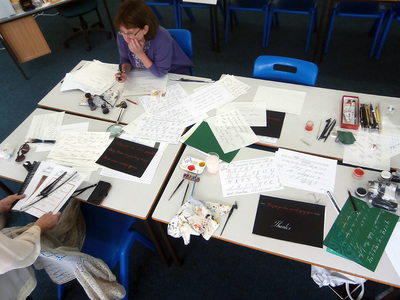 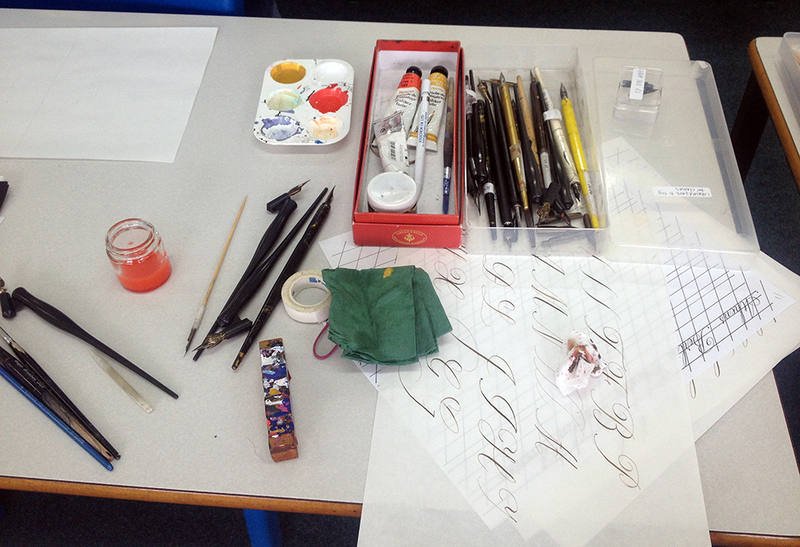 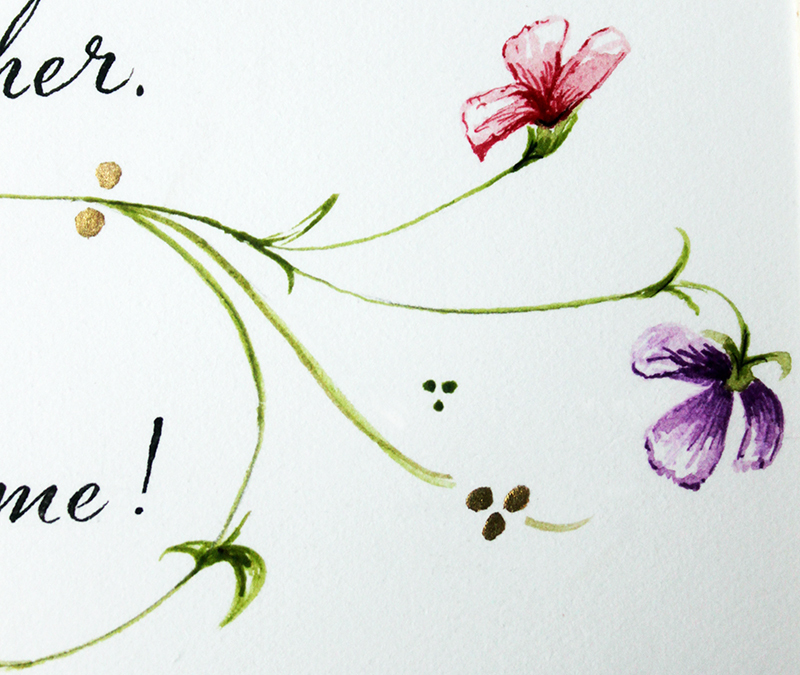 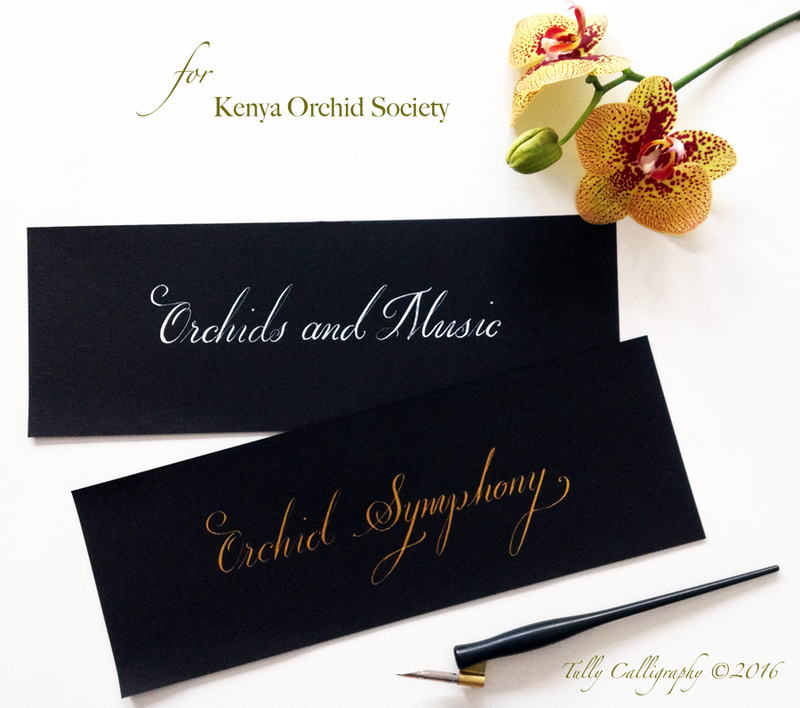 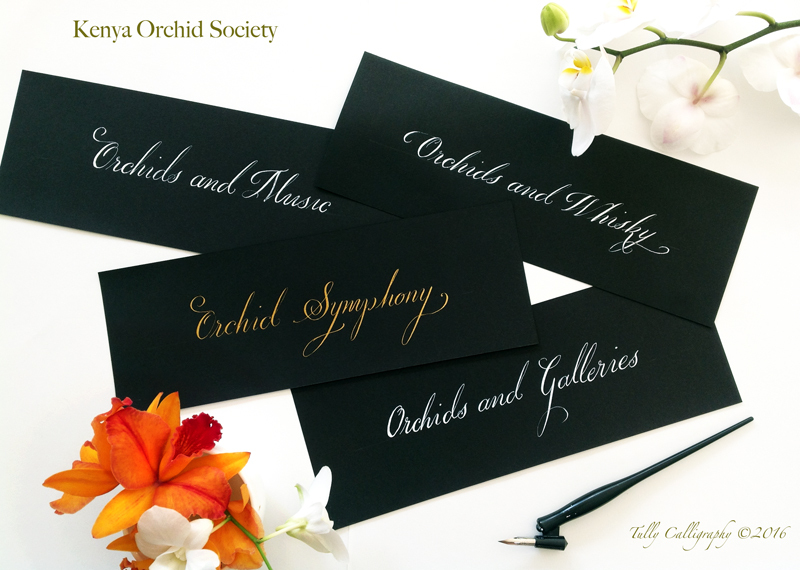 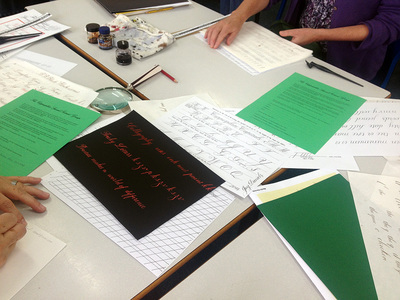 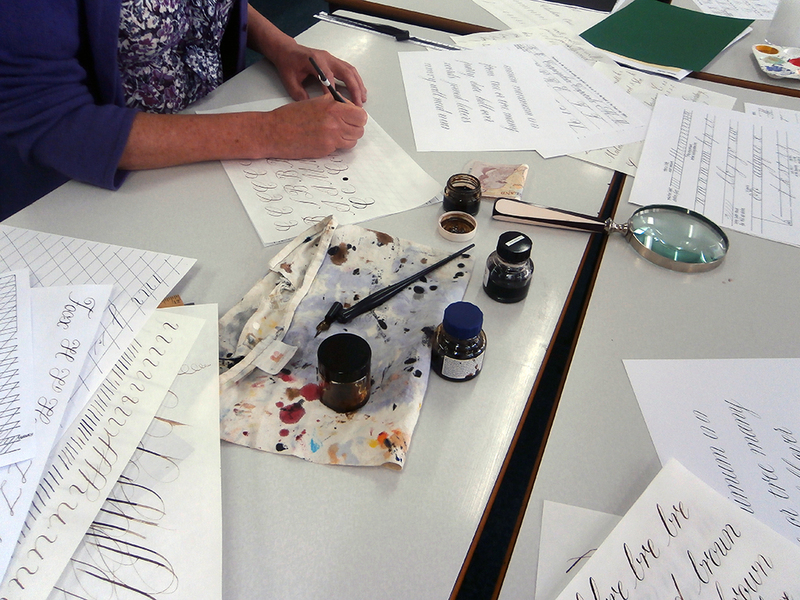 Now based in Nairobi, I have the pleasure of volunteering to write some calligraphy for the Kenya Orchid Society. 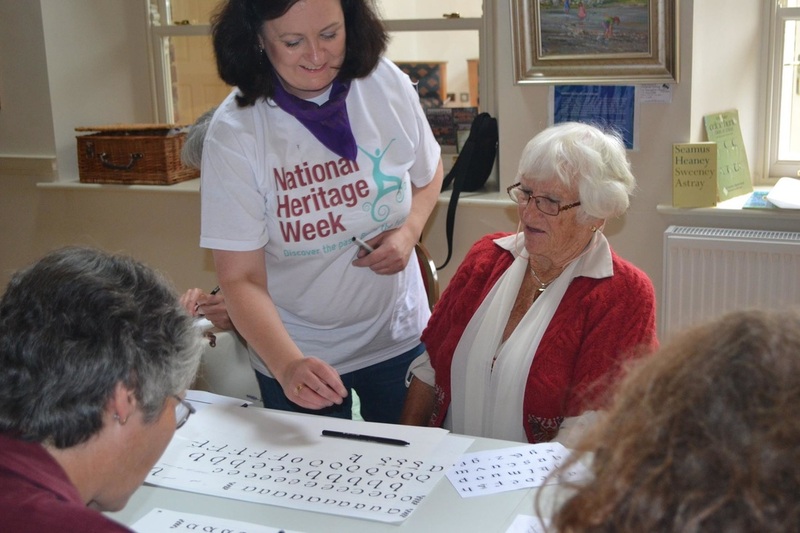 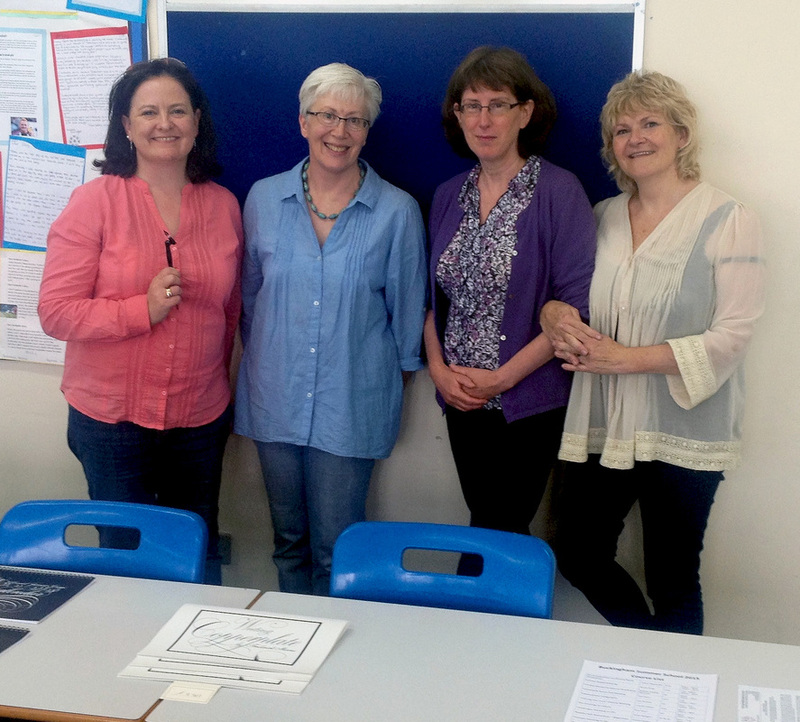 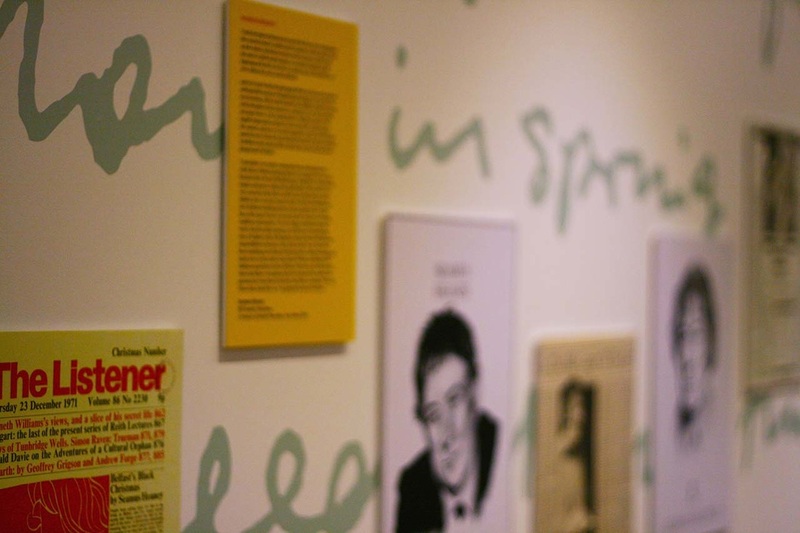 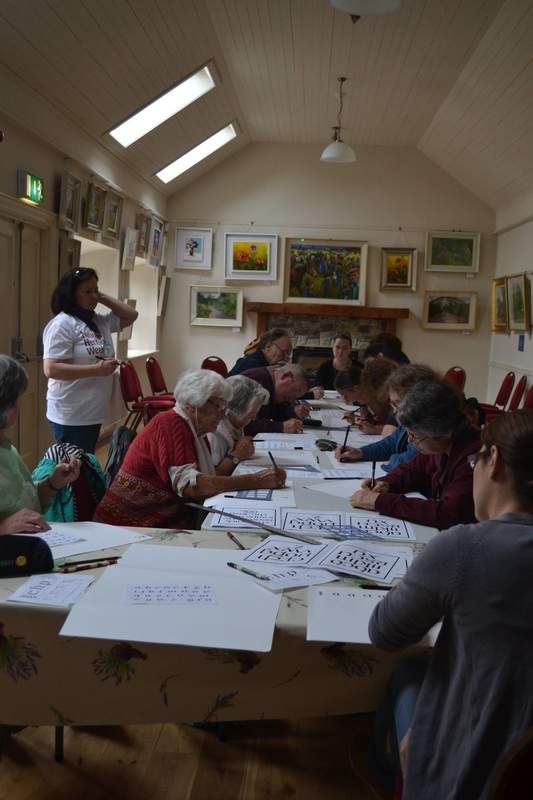 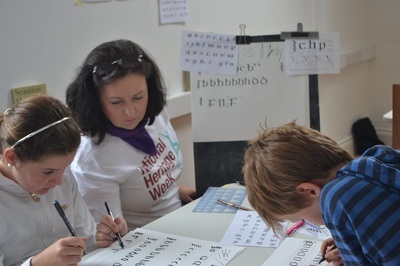 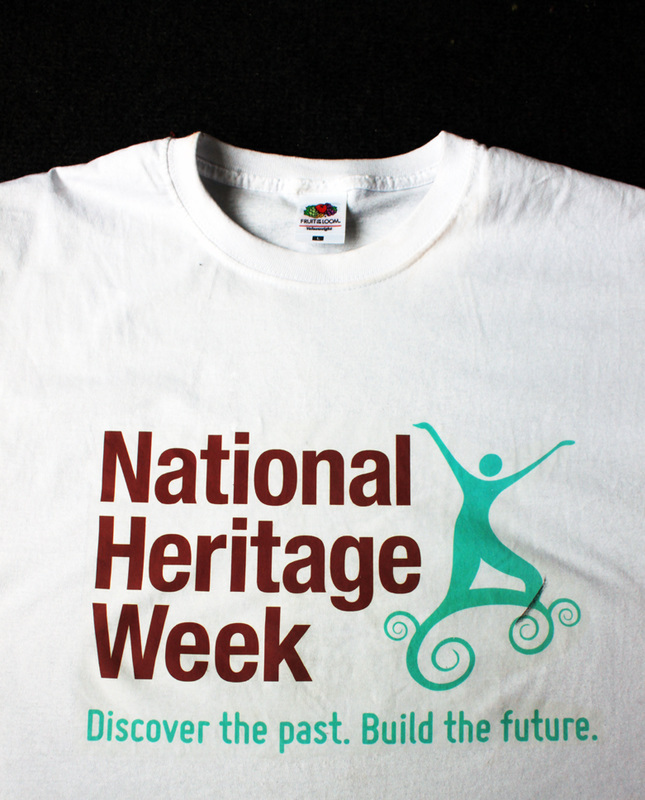 A Worthy Cause is the studio led by Graphic Designer, Ronan McDonnell, and he was the creative designer behind the Seamus Heaney exhibition at Ashford, in April 2015, which I participated in with the wall calligraphy.It was a great project...thanks to Deirdre Burns for making it work so well. 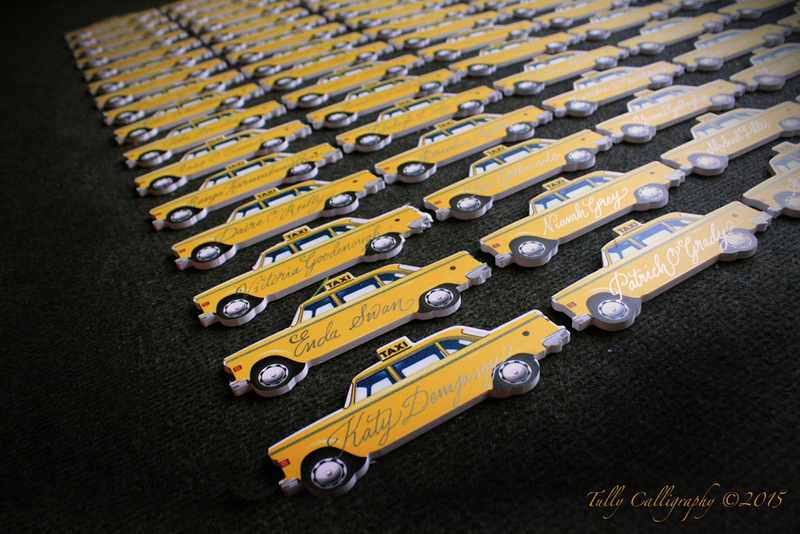 You wait hours for a cab...then 80 come along all at once. 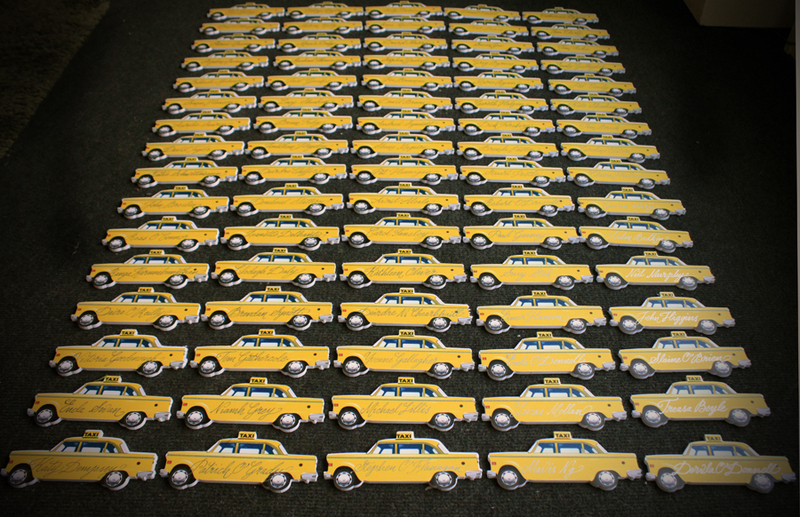 Personalised Yellow Cabs for the fun folk at Verve and Marco Pierre White Restaurant. 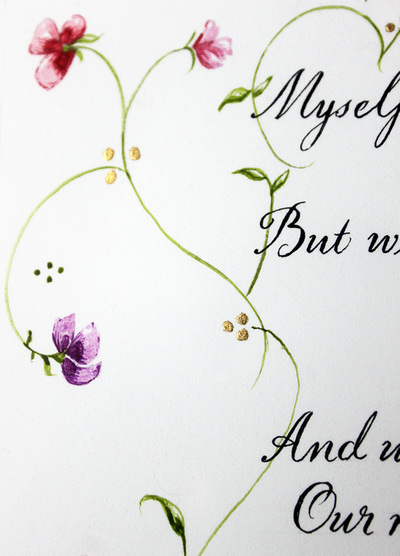 Okay there was really 81...but OCD and all that. 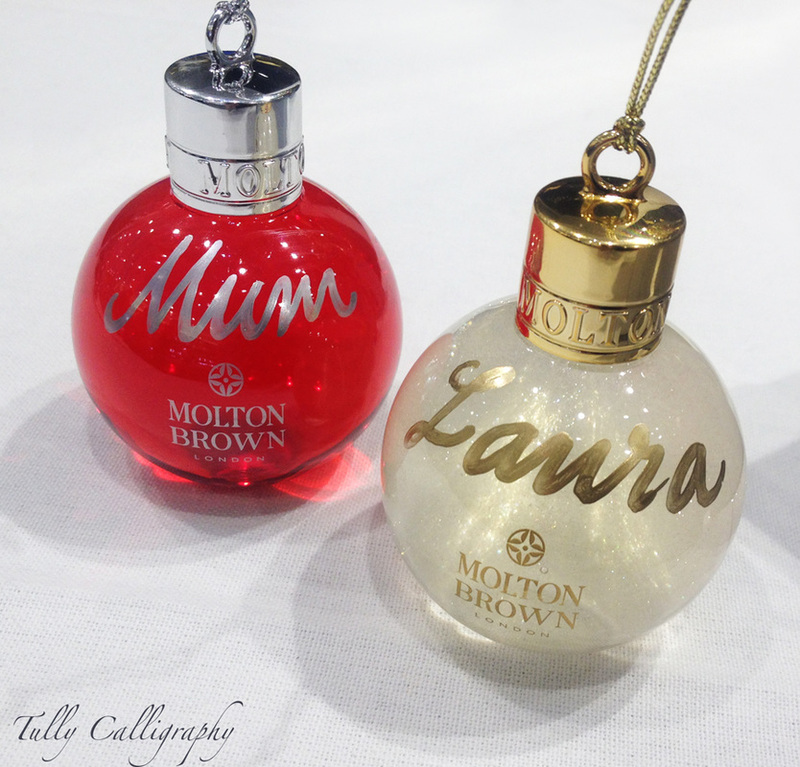 Delighted again this year to work with Molton Brown and personalising their lovely products for their festive evenings in Grafton Street and Arnott's. 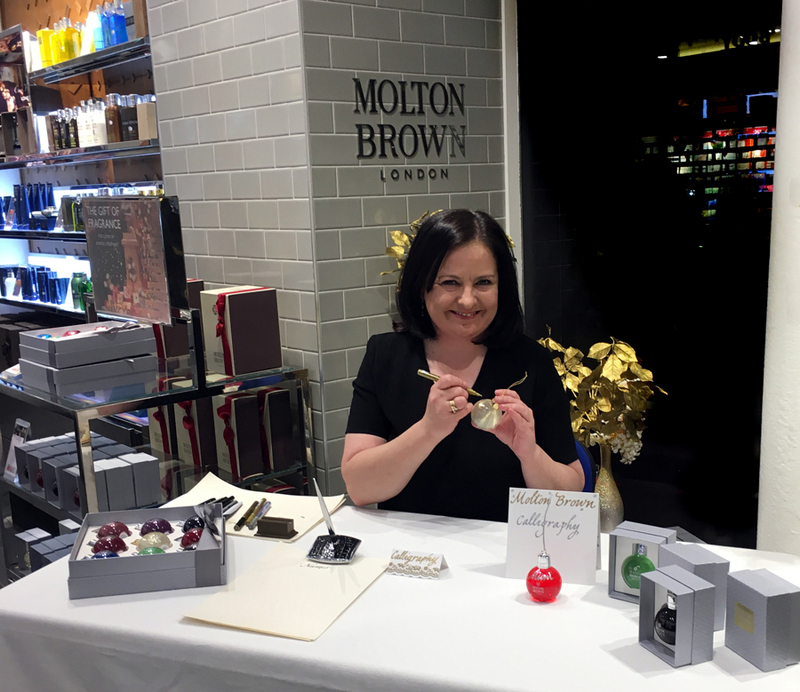 The Molton Brown staff in both stores are amazing ; they are on their feet all day, always smiling, immaculately-presented and helpful to customers - I loved working with them. 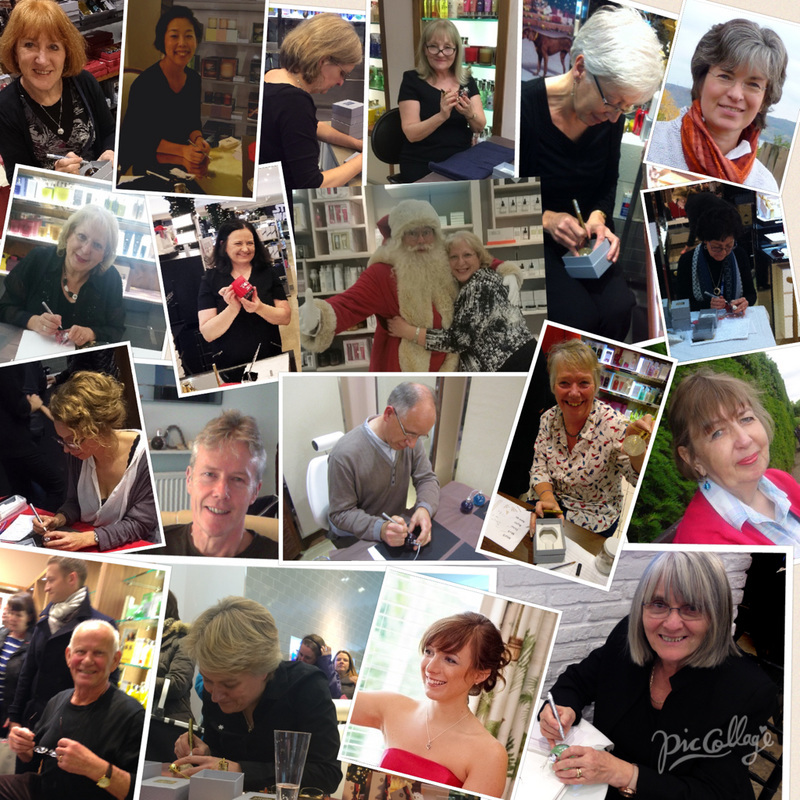 Customers I met have pledged to get their fountain pens out, shake them up, fill 'em with ink and start writing letters again. 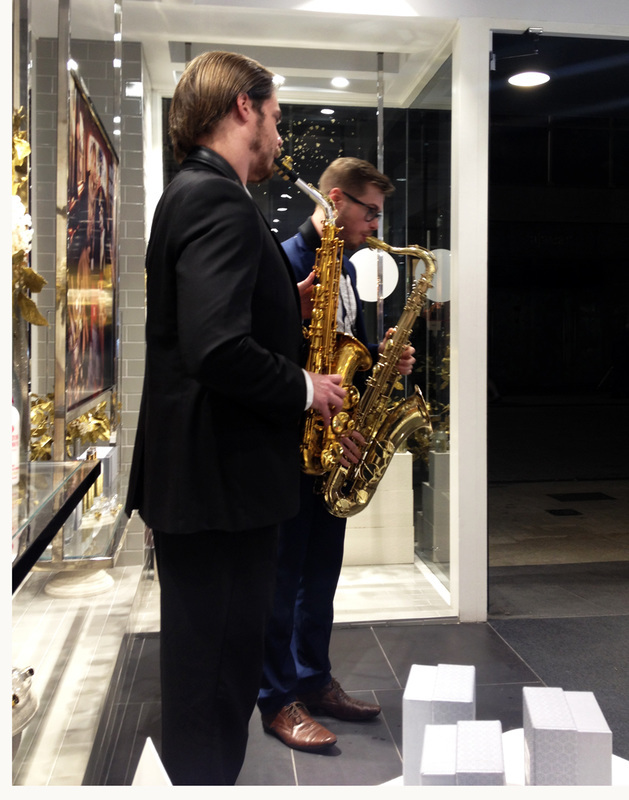 Thank you Molton Brown, Paula Comparini and Noeleen Frain for a fun, festive four flourishing Fridays. 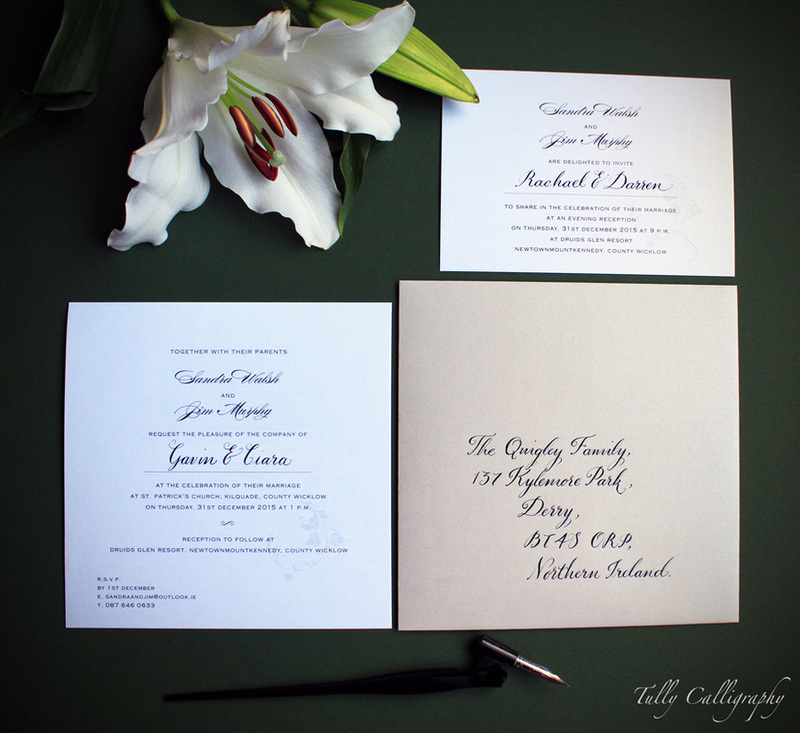 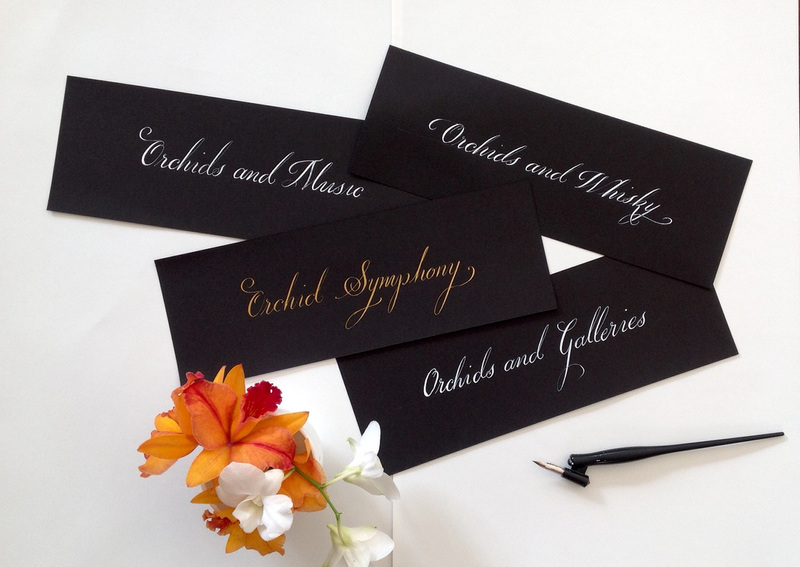 Following on from the lovely Save the Date cards & envelopes, I was delighted to work on the bride's wedding invites, evening invites and envelopes in Copperplate. 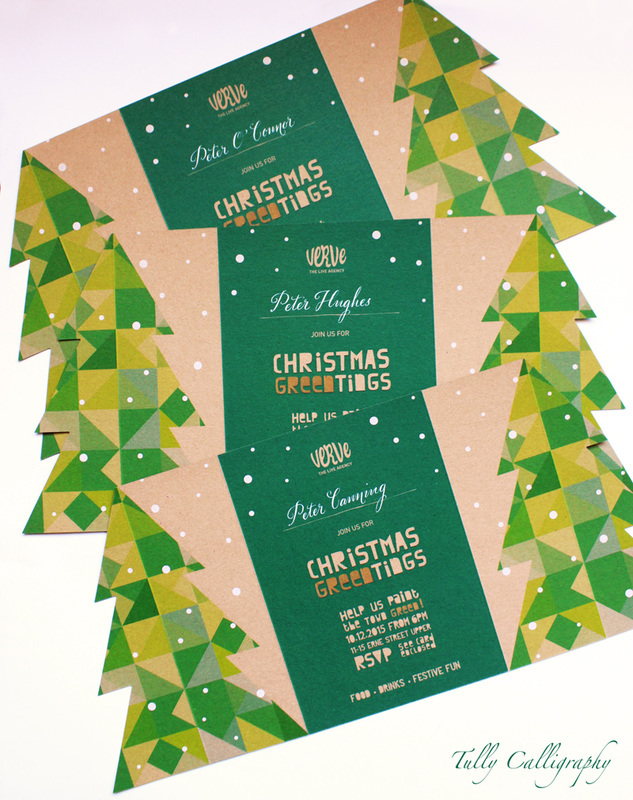 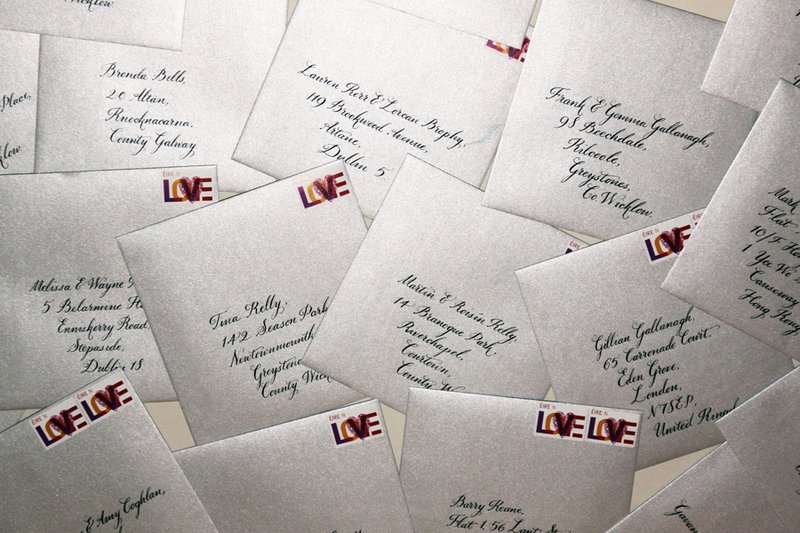 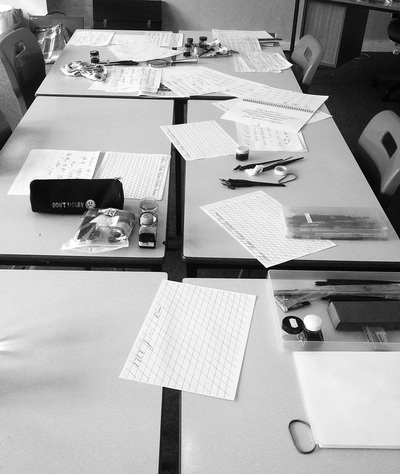 The envelopes were a shimmering silver and every one of them beautiful to write upon. 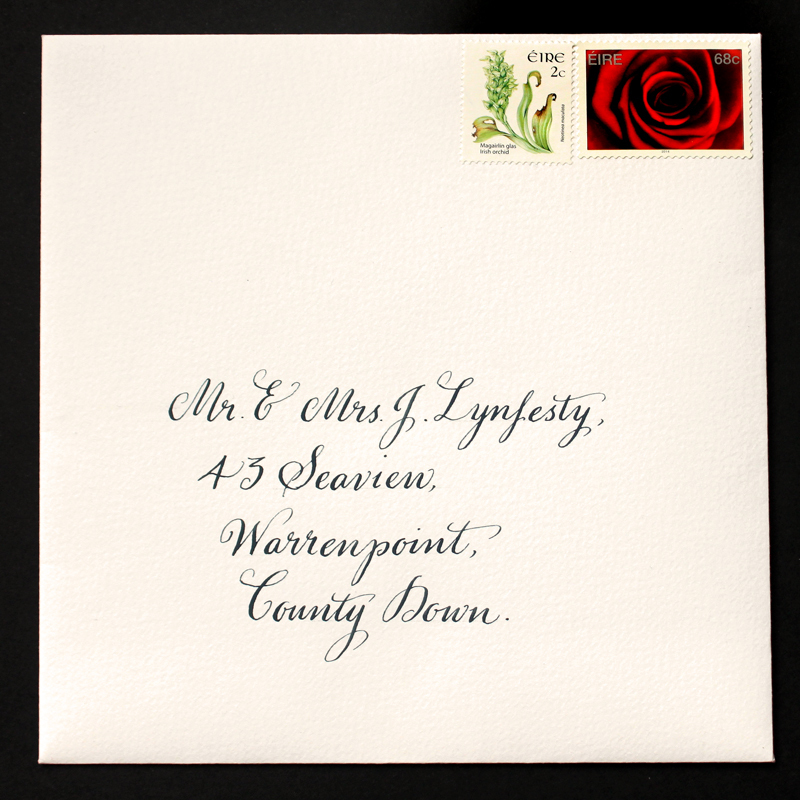 Best wishes to a wonderful bride Maria and her groom on her wedding in beautiful Powerscourt House, Co. Wicklow. 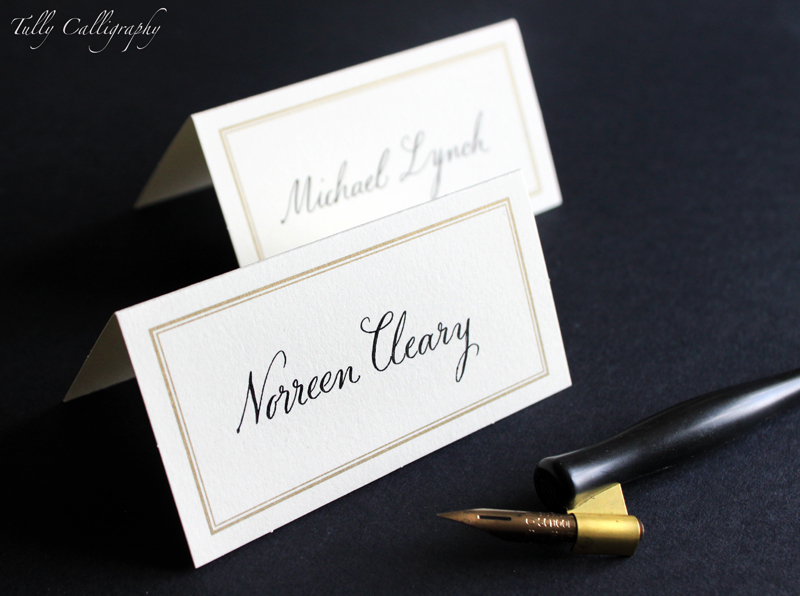 Delighted to help out with place cards, wedding menus and the horsey-themed table names. 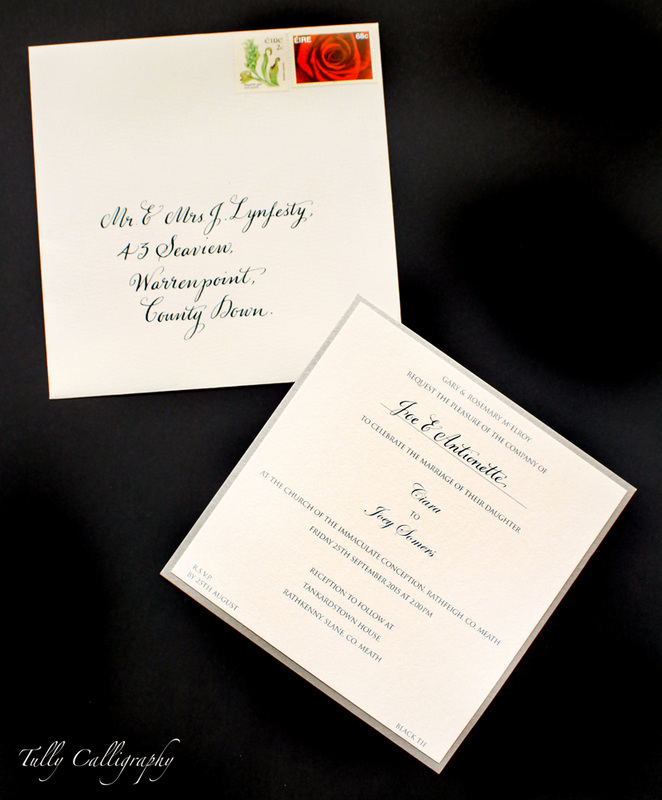 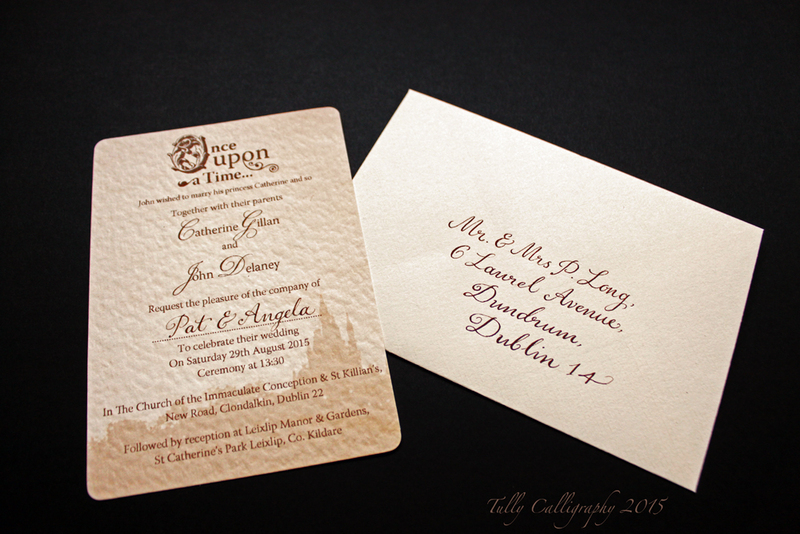 This wedding has a Disney theme and I was thrilled to work on the invite names and envelopes for a lovely couple.